FAQ - Curaderm BEC5 Eggplant Extract cream known as Curaderm for the alternate treatment of skin cancers such as Basal Cell Carcinoma, Squamous Cell Carcinoma. Curaderm is the Eggplant Skin Cancer Treatment By Dr Bill Cham for non-melanoma skin cancers and Actinic Keratosis. Please use our search bar at the top right of the page if you can not find your question here. We have many articles in our databases. How to treat yourself with Curaderm BEC5? What kind of Skin Cancers does Curaderm treat? What is the difference between sun, skin, liver and aged spots? How long will treatment take with Curaderm? Is there a risk of infection during treatment with Curaderm BEC5? Can I simply eat eggplant? Can I use Curaderm without seeing a Doctor first? Is it normal for my lesion to deepen and look larger during treatment? How can I buy a hard copy of ‘The Eggplant Cancer Cure’? How long will it take for Curaderm BEC5 to treat my lesion? Is it normal for my lesion to deepen and look a little larger? Curaderm is unique in that it only attacks cancerous cells and it won’t harm healthy ones. This means that you can continue treatment while the lesion heals with healthy cells. You can expect the lesion to grow a bit during the initial phase of the treatment as the Curaderm BEC5 is destroying the cancerous cells that often extend under the surface of the skin further than the surface lesion itself, but rest assured that Curaderm won’t attack healthy cells and hence the lesion will eventually heal over while you continue your treatment. Treatment can take a couple of weeks to well over a month in some cases, depending on how large the lesion is. There is no fixed time for a treatment, you should only stop treatment when the lesion has completely healed over with skin. By continuing your treatment while you are healing the pH of the Curaderm keeps the lesion safe from infection. Also, if you were to cease treatment early you could never know for sure exactly when all the cancerous cells have been destroyed and hence leave yourself at an elevated risk of a reoccurrence. I guess another reason to keep treating until the lesion has completely healed is because this is how Curaderm was tested in the clinical trials, and if you stopped treatment early then your statistical chance of success may be lower than those published about Curaderm (which has been almost 100% in some trials). Can I use Curaderm BEC5 without seeing a doctor first? Before commencing treatment with Curaderm BEC5, we highly reccomend that you see a Doctor first and have a biopsy performed to see what type of cancer you have. If it is highly pigmented there is a possibility that the cancer could be a Melanoma. In this case, the cancer could metastasize and spread though the body fast and needs to be treated by surgery to remove the cancer as soon as possible to prevent this from happening. We do not recommend that you use Curaderm BEC5 if you have a Melanoma as it may not treat it fast enough putting you at risk of death. Unless you are familiar with your skin lesion and can identify it as a basal cell carcinoma or a squamous cell carcinoma, you should see your Doctor first for a biopsy. If you have a metastasized Squamous Cell Carcinoma you could also require surgery, 2 – 3% of SCCs can metastasize. This can effect your lymph nodes and they may be swollen indicting that the SCC has metastasized. If you do try Curaderm BEC5 without consulting a Doctor for a biopsy, use it first only on a small lesion to see what happens. If you are concerned, please contact our team or consult a Doctor during this test but, we do suggest you see a Doctor first for a biopsy to confirm you do not have a Melanoma. What if I apply Curaderm BEC5 to a lesion that is not cancerous? Will it have an effect and will it cause any issues? Unless you are taking or treating your skin with any other treatment that will cause side effects, you will not have any issues. What treatments/medications will cause side effects if I am using Curaderm BEC5? Any treatment/medication that makes the skin sensitised such as Cortisone, Prednisone or Roaccutane. Please do not use Curaderm BEC5 if you are on treatments such as this. If you are unsure or concerned, please confirm with your doctor if any treatments you are taking may sensitise the skin. How do I treat myself if I have numerous lesions? It is best to treat one lesion first. This will allow you to determine your treatment comfort level and also show you how the treatment will react with your skin. Sometimes your skin will experience a burning feeling and by treating one lesion first you will become accustomed to this sensation. After treating one cancer you may then decide to treat numerous others all at once. If you have any worries, please send us a picture and will will advise you. Treating a large lesions or many at once many be uncomfortable for you, that is why is it best to try Curaderm BEC5 on a smaller lesion first so you are aware of how the treatment works. Having many lesion does not mean you cancer has metastasized. These are separate cancers and lesions. Are there any skin cancers that Curaderm BEC5 can not treat? Curaderm is not a recommended treatment for melanomas. Kaposi’s Sarcoma is a cancer cause by the HIV virus, Curaderm BEC5 can treat this cancer. Curaderm BEC5 has been used on many cancers on the skin and most skin cancers have been found to have the receptor. Please consult us first before using it on anything other than a Basel Cell or Squamous Cell Carcinoma. What is the shelf life of Curaderm BEC5? The shelf life of Curaderm BEC5 is 5 years. Each bottle is date stamped on the crimping. Studies have been performed over a 5 year period with testing every 3 months to check the effectiveness of the glycosides in Curaderm BEC5 and scientific data shows that the glycosides are effective for 5 years. How do I store my Curaderm BEC5? Curaderm BEC5 should be stored in the fridge. If it is exposed to an environment of 60 – 70 degree celsius (140 – 158 degrees fahrenheit) the active ingredients could separate. This temperature can be reached in a car on a hot summers day. Curaderm BEC5 should be kept below 25 degrees celsius (77 degrees fahrenheit) and it will maintain its shelf life of at least 5 years. How do I know if my Curaderm BEC5 has separated and needs reconstituting? If you suspect your Curaderm to have separated, you can confirm this by shaking the bottle. If it has been separated (due to prolonged excessive heat) you will hear sloppy liquid. When the cream is constituted (together) it does not make a noise when you shake it, you will not hear sloppy liquid. You should shake you bottle when you receive it to check that it has not been exposed to high temperatures during transit and to find out if it needs to be reconstituted. What will happen if I use Curaderm BEC5 and it is not reconstituted? Curaderm BEC5 is made up of many complex ingredients that are designed to deliver the glycosides effectively. If these separate you may only be applying one part of the cream and hence not receive the full effect of the treatment. This is why you should shake you bottle when you receive it to check that it has not been exposed to high temperatures and to find out if it needs to be reconstituted. Always store your Curaderm BEC5 in the fridge. What if my Curaderm BEC5 has been exposed to hot temperatures? Curaderm BEC5 can be reconstituted if you receive the product and it has separated. This is very simple to do. Place the tube in water that is at least 60 degrees celsius (140 degrees fahrenheit) – hot tap water. Shake the tube vigorously for 1 minute and than place it in the freezer for at least 10 minutes. After this time, the cream will be ready to use. Make sure you than store your Curaderm BEC5 in the refrigerator. Why doesn’t Dr Bill make Curaderm BEC5 more stable in hot temperatures? Two of the main ingredients that make Curaderm BEC5 so effective can not be removed to make this product more stable in hot temperatures. If they are removed Curaderm BEC5 will not be as effective. Trials have been run to test this. Curaderm BEC5 contains Salicylic Acid which is obtained from Willow Tree Bark, this will help prevent any infection. You may think that you have an infection during treatment but chances are this is just the dead cancer cells. If you are worried, you can treat the lesion with disinfectant such as Dettol, Peroxide and Mentholated Spirits. After treating it with these products, please rinse the lesion with water and than dry completely before applying the Curaderm BEC5. You can also email us a photo for advise if you are concerned. You apply a thin layer (about 2 millimetres thick) of Curaderm BEC5 to the skin. You do not need to rub the product in. When you apply a pad to the Curaderm BEC5, it will spread out, this will cover the area that needs to be treated. Please cover the lesion plus a small amount of the skin around it with Curaderm BEC5. Do not spread it too far, as the pad will spread it for you. After treatment commences, your lesion may appear larger and you may need to apply more Curaderm BEC5 to cover the area. Then once it starts to recede, you won’t need to apply as much. Keep applying the Curaderm BEC5 until the lesion is completely gone. One bottle of Curaderm can get rid of 5 – 6 small Keratosis, so please keep it in the fridge as it can last 5 years. A worth while investment of US$147 + postage. The fruit of the Devil’s Apple plant (Solanum Linnaeanum) has been suspected in stockman’s folklore as a treatment of eye cancer in Hereford cattle. It is folklore that brought the plant to Dr Bill’s attention and had him begin over a quarter of a century of research. He set out to discover the active compounds of plant. His discovery led to the patenting of purified glycoalkaloids mixture, which is known as BEC. He subsequently established that the BEC was also present in edible fruit such as the eggplant or aubergine (Solanum Melongena). Eggplants are members of the Solanaceae (Night Shade) family, classing them as relatives to the tomato, green pepper and tobacco. The species name melongena means ‘soothing mad apple’, as it once had a reputation, wrongly so, of inducing insanity. It has been reported that eating eggplant lowers blood cholesterol, helps counteract detrimental blood effects of fatty foods and clears toxic hat from the body. Eggplant is used to relieve pain, hypertension, stomach ulcers, colitis, constipation, bleeding hemorrhoids, swelling and tumours. Eggplant is reported to have an adverse effect on people suffering with rheumatoid arthritis and osteoarthritis. No controlled studies have been done to substantiate the above claims of eggplant but these claims do make it an amazing fruit. The BEC was been tested over a twenty five years period. This involved basic research, pre-clinical and clinical research. 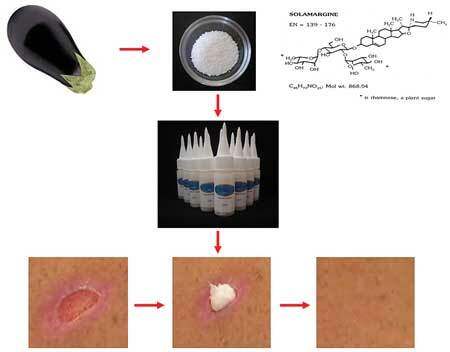 This research established that BEC, at lower concentrations than present in an eggplant and put into a cream formulation known as Curaderm BEC5, is an effective for treating non melanoma skin cancers. The glycoalkaloids in BEC are currently undergoing trials in humans suffering from terminal internal cancers. If only it was that simply. Unfortunately this is not the case. Initially, Dr Bill extracted the alkaloids from the eggplant. He identified these alkaloids as solasodine. However, he showed that solasodine had no anticancer properties. Subsequently he modified his extraction procedure to obtain the alkaloids in their native, natural state. He discovered that the alkaloids were not present as free alkaloids, but they were attached to certain sugars rendering them as glycoalkaloids. These purified glycoalkaloids were the substances in the eggplant that showed tremendous anticancer properties. Further studies showed that if they were not purified to a certain standard their efficacy as anticancer agents dropped drastically. More investigational work was required to determine why this was the case. Dr Bill then discovered that certain free sugars also present in the eggplant were affecting the anticancer properties of the glycoalkaloids. When these sugars were eliminated by further extraction the anticancer properties of the glycoalkaloids were optimal. The “free” sugars were inhibiting the anticancer effects of BEC. This means if you were to eat eggplant containing BEC you will also be ingesting the “free” sugars which nullify the anticancer properties of BEC. Are there other creams available? Various unscrupulous companies have preyed on the results of the extensive work done with Curaderm BEC5, and are making false claims that their products are equivalent or better than Curaderm BEC5. Little or no studies have been done with their products and these companies are cleverly attempting to deceive the public by associating Dr Bill’s published work in their advertising material. It appears that there are no limits for supplying fraudulent information for what we assume is to become rich. As described earlier in this book, it is not a simple matter of having glycoalkaloids in a cream or gel and assumes that this is a treatment for skin cancer. Cancer is a serious condition. A tremendous amount of careful work was done to obtain these purified glycoalkaloids without traces of their inhibitors (interfering substances) from the plant materials. If this preparation is not properly completed, the end product will be useless, as experienced by patients who have been cleverly enticed to use counterfeit products. Some products out there that claim to be like Curaderm BEC5 or other creams will eat your skin away, not only acting the cancer cells but the good skin cells as well. These products do not no when to stop and will leave you with horrible burn like scars. Please be careful if you choose to experiment or use other products, other products can act as amino suppressants causing immediate and long term health issues. Many blogs can be found online in regards to the negatives of using Aldara and Black Salves. Are there any reasons why you would choose surgery over Curaderm BEC5? If the cancer is a Melanoma it is not recommend that you use Curaderm BEC5. You should have the Melanoma removed through surgery as it can spread very quickly through your body. If you have a metastasized Squamous Cell Carcinoma you should also have surgery, 2 – 3% of SCC can metastasized. This can effect your lymph nodes. Curaderm BEC5 has successfully treated many cancers that would have needed very large skin grafts when surgery was performed. This would leave terrible scarring to the patient but when using Curaderm BEC5 little to no scarring is visible when treatment is completed. If I have had a Basal Cell Carcinoma or Squamous Cell Carcinoma in an area and another lesion forms is it safe to assume it to is a BCC or SCC? Chances are they are the same but if they are highly pigmented it could be a Melanoma. It is recommend you see you Doctor for a biopsy unless you are extremely familiar with these cancers. It does not mean your cancer has metastasized just because you have more than one in an area. Having had BCCs or SCCs will not increase your chances of getting cancers in the area that was effected. Melanomas originate from the melanocytes, which create the dark pigment and are deep down in the skin. Squamous Cell Carcinomas develop from the squamous cell skin layer and Basel Cell Carcinoma from the basel cell skin layer which are not as deep. This is what makes it harder for these cancer to metastasize through the body. During treatment, take periodic photos every few days. If you have any concerns about how your treatment is going, please email us a photo. We can than advise you straight away and let you know if you treatment is progressing normally. This will ease your mind of any concerns. Do we use Curaderm BEC5? Yes, Dr Bill and his wife have both treated lesions using Curaderm BEC5 with great success. Had a biopsy on hand, came back as SCC. I’ve been applying BEC5 cream 4-6 times a day for 11 days. Lesion was dime-size or smaller, grew to quarter-size and larger. First main scab came off last night, Feb. 1. New scab is forming again under and around lots of white skin (dead cells?) that keeps forming. 2. Is the hydrogen peroxide okay to use instead of a ‘bacterial lotion’ (?) ? 3. Will the lesion keep scabbing up during the healing? What does the scabbing mean? 4. Is all the white ‘skin’ dead cells? 5. Why is the skin surrounding the actual lesion so red and irritated? 6. It’s hard to tell where the lesion begins and ends. Should I treat all the white and new scabbing as the ‘lesion’? Thanks. Overall I’m pleased, just don’t know what to expect or what I’m seeing.